Let’s start with the similarities first: The setup as well as the main game mechanics are almost the same as in Star Realms. 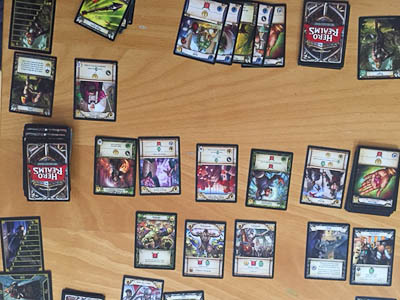 So if you are familiar with Star Realms, it is quite easy to begin a game after only a short quick look at the rules. 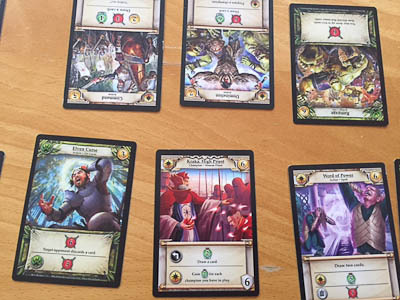 For all the rest of you let me explain that Hero Realms is a traditional deckbuilding game. It is similar to Magic and Dominion, but it is much more compact and less complex. 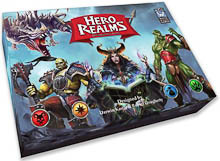 Hero Realms is no collectable or living card game, so with the base box you get everything you need for playing the game with 2-4 players. You can expand the game to play with more players by an additional deck of Hero Realms, but for me the game is just perfect in the two player variant, so I am not in need of more cards. And because many of the cards are unique, there is already a lot of variation from one game to the next. 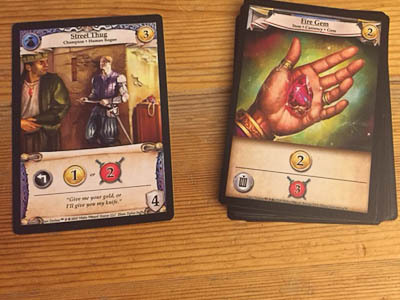 All players begin the game with a personal deck of 10 cards, that are the same for all players: a short sword, a dagger, a ruby and seven gold cards. And as in other deckbuilding games these cards are shuffled to build up our personal draw deck. New cards can be bought from a Market. At set up the Market deck is shuffled and placed face-down in the middle of the table. Five cards are dealt in a row that build up the Market for the players. Additionally a deck of 16 fire gem cards is placed next to this market. These special cards can be bought, too, if you cannot or do not want to purchase cards from the Market. Finally, each players draws the top five cards of his personal deck. Alternately we take our turns. In each turn all of our hand cards are played, so you cannot keep cards for the next round. All cards have a primary ability, some also an ally ability. 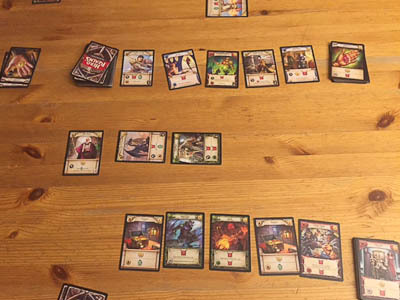 The primary ability is used immediately after the card has been played, the ally ability only if you have another card of the indicated faction in play. 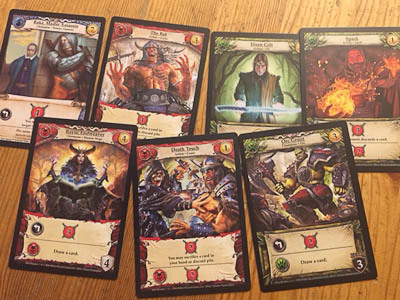 In Hero Realms there are four different factions, indicated by different colours of the cards and it is quite useful to keep in mind, which cards you have already bought. Using the ally ability is one of the most important things to win a game. So a card literally is boosted, if you have another card of the same faction in play. The most important ability of a card is to attack your opponents. Starting the game with 50 healthy points, in an attack we lower the health of our opponent by the same amount as the sum of all our combat points in play. No less important is to keep an eye on the health of your own hero (yes, he or she might be attacked too). Therefore, it is always good to have some cards with the health symbol in its primary or ally ability in our deck for heal our hero again. Next to attacking and healing points, many of the cards have special effects when played. Some let you draw more cards from your draw pile, some force your opponents to discard cards from their hand and still others let you scrap cards from your hand or your discard pile. The latter indeed is quite useful, especially at the beginning of the game, because with progressing time, the cards of your starting deck will be less effective or better said: the new cards from the Market are much stronger. Therefore, it is better to get rid of weaker cards (well it is a deck building game, so all of your discarded cards will find a way back into your hand until you scrap them...). Finally a lot of cards give you money to acquire new cards from the market. Of course new cards do not enter your playing area directly (unless a card says something else), but normally they find their way to your discard pile first. So only if your draw pile is empty (each turn you draw a new hand of five), you shuffle the discard pile and by this new cards come into play. That all will not surprise you, if you know other deckbuilding games. However, what makes this game exceptional are the champions (comparable with the bases in Star Realms). These cards come into play as all other cards, but in contrast to the normal cards, these cards stay in play, until other players defeat them. Some of these champions even act as guards, so no one can attack your hero before the champion has been eliminated. Despite or perhaps because of its simplicity, Hero Realms casts a spell on the players. There is seldom a game without a rematch, you simply can`t get enough. But do you really need Hero Realms if you already have Star Realms. Well first of all that depends on your taste. Do you prefer the fantasy theme or are you more a Science Fiction fan? As said the game nearly the same, but of course the cards differ a lot. I have the impression that the cards in Hero Realms are slightly more powerful and it is much easier to forget your starting deck. But what makes the game really interesting for the future are the campaign rules of coming expansions. It all starts with a simple character package to play the game as a wizard, a knight or someone else. With this individual characters not only the starter cards will change, you will also have different health points and special abilities. But still everybody will expand his deck from the general supply. Later we will also have campaigns, in which you will improve your characters from game to game. A game entirely to my taste and again a great success for White Wizard Games. Thumps up!